Breakout Poker is part of the portfolio of gambling products of Breakout Playa Limitada. The company entered the industry in 2017 and offers betting, eSports, and casino games as well. The poker room initially shared the player pool with VBet Poker. As of the end of 2017, it became part of the Good Game or GG poker network. The platform is full of Asian recreational players which is one of the main reasons Breakout Poker decided to move there. Another benefit for the customers is the opportunity to earn Breakout Poker rakeback at a solid rake. It’s curious that the operator has its own cryptocurrency called BRK. Another interesting fact is that Breakout Poker has its own pro team that includes popular names such as Todd Branson. Johnny Chen, and Vladimir Shchemelev. It’s a testimony to the operator’s credibility. If you are interested in learning more, feel free to check our Breakout Poker review that contains the most important facts about the online poker room. A quick look at Pokerscout shows that Breakout Poker’s GG network is ranked 6th when it comes to traffic. As you could assume, this means there’s a ton of action. Our Breakout Poker review showed an interesting phenomenon, as there are two peaks in the traffic. The first one is related to Asia. The origin of the network and the large pool of local players are the reasons you will find plenty of action in morning/noon European hours. This is a good time to play at Breakout Poker because the level of the competition is not very good. There are plenty of recreational players and enough tables to earn Breakout Poker rakeback. The second peak when it comes to active players is during the European evenings. A lot of players from this continent joined the GG network in the past year or two, so this is only natural. On the negative side, the opponents during this second Breakout Poker peak are tougher and you will have a harder time finding fish. High limits: finally, you could also play $400, $1k, and even the Breakout Poker Super High Stakes $25-$50 tables with unlimited buy-ins. The games run at almost any given moment and especially during the Asian or European evenings. Our Breakout Poker review also included a couple of other exciting formats. For example, the Fortune Spins. They are hyper-turbo SNG tournaments with a buy-in between $1 and $15. The prize pool is random and you could either collect symbols for a prize or fight for a 4x or a 10x jackpot. Next in line is the Breakout Poker All-in or Fold section. This format is hard to find anywhere else. As the name, suggest you have only two options in each hand – to push or to fold. You can play either Omaha or Hold’em. There are a couple of levels, a jackpot, and the opportunity to earn plenty of Breakout Poker rakeback if you go for the All-in or Fold option. Another thing you should know is that the Texas Hold’em hands start preflop, while the action is on the flop in Omaha. The last format we explored during the Breakout Poker review were the multi-table tournaments of the online poker room. There is a decent number of guaranteed MTTs with various buy-ins. It’s interesting that you can actually buy or sell action. Also, Breakout Poker offers both Texas Hold’em and Omaha events. 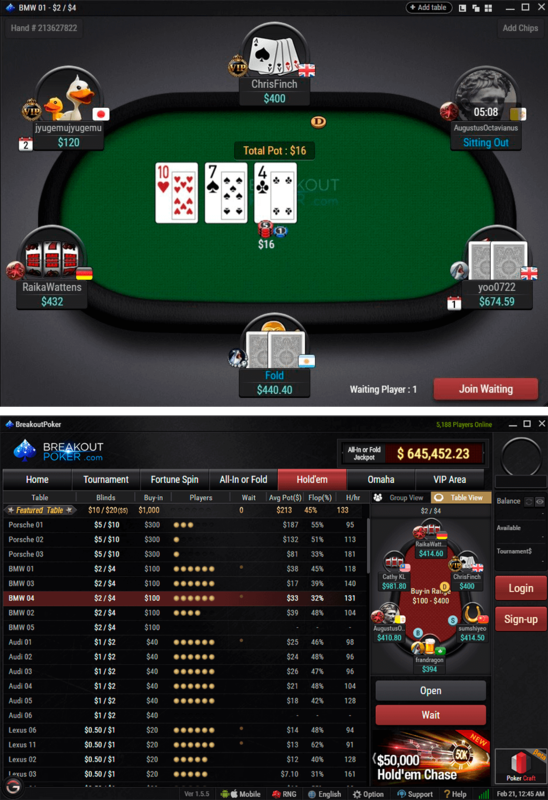 The software of Breakout Poker is pretty smooth and allows you to easily multi-table on PC. You can customize various options, such as the deck and other stuff that makes comfortable if you intend to grind for Breakout Poker rakeback. As many other Asian rooms, Breakout Poker is also available on mobile. You can run the games on both iOS and Android, if you want to. Finally, it’s strictly forbidden to use any external software, including the likes of Holdem Manager or Poker Tracker. If you try to do it and get caught, you will lose your Breakout Poker account. We strongly recommend you to resist the temptation, because the management of the GG Network is trying to protect the fish in any way possible. All-in or fold: you pay a fixed fee each hand. Half of it goes to the jackpot pool, the other half counts as rake and is considered when the Breakout Poker rakeback is distributed. According to the new loyalty system Fish Buffet, you are able to get 10% to 100% rakeback. More details are available in the article, or contact us. How to register in Breakout Poker?